Having finished my Leaving Certificate Exams in 2009, I was delighted to hear that I have been granted the All Ireland Scholarship for the duration of my undergraduate studies. My family and I were very happy of this as it meant that the financial support would cover my tuition fees and I could concentrate more on my studies. In September 2009, I began my four year long course in aeronautical engineering at the University of Limerick. I always had a keen interested in aircraft and this course presented the best opportunity for me to learn every aspect of aircraft systems design, operation, repair and overhaul. Throughout the course, there was always a friendly and enthusiastic atmosphere since all the students and lecturers all shared the same interest in aviation. I think that this is one of the biggest differences I experienced in the transition between second level and third level education. In August 2013, I graduated my course with a first class honours degree and an accumulated Grade Point Average of 3.99 out of 4.0. 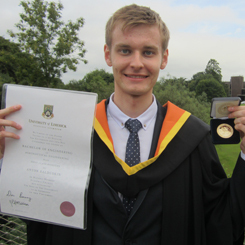 I received the University President’s gold medal for achieving the joint highest GPA value out of the 2013 graduating class of the University of Limerick. Today, I am really happy to be studying something I really enjoy at a postgraduate level. I am undertaking an MSc in Aerospace Aerodynamics at Cranfield University. Looking back at my years as an undergraduate, I think that it would not be possible for me to be where I am today and to have achieved everything I have achieved, if I was not granted the All Ireland Scholarship. Thanks to the financial support, I was able to explore every area of aeronautical engineering and make a decision on what I would like to do in the future as well as build a solid foundation for my career as an aerospace engineer.